Pazos, M., Otten, C. and Vollmer, W. (2018). Bacterial Cell Wall Precursor Phosphatase Assays Using Thin-layer Chromatography (TLC) and High Pressure Liquid Chromatography (HPLC). Bio-protocol 8(6): e2761. DOI: 10.21769/BioProtoc.2761. Whitney, J. C., Peterson, S. B., Kim, J., Pazos, M., Verster, A. J., Radey, M. C., Kulasekara, H. D., Ching, M. Q., Bullen, N. P., Bryant, D., Goo, Y. A., Surette, M. G., Borenstein, E., Vollmer, W. and Mougous, J. D. (2017). A broadly distributed toxin family mediates contact-dependent antagonism between Gram-positive bacteria. Elife 6: e26938. Peptidoglycan encases the bacterial cytoplasmic membrane to protect the cell from lysis due to the turgor. The final steps of peptidoglycan synthesis require a membrane-anchored substrate called lipid II, in which the peptidoglycan subunit is linked to the carrier lipid undecaprenol via a pyrophosphate moiety. Lipid II is the target of glycopeptide antibiotics and several antimicrobial peptides, and is degraded by ‘attacking’ enzymes involved in bacterial competition to induce lysis. Here we describe two protocols using thin-layer chromatography (TLC) and high pressure liquid chromatography (HPLC), respectively, to assay the digestion of lipid II by phosphatases such as Colicin M or the LXG toxin protein TelC from Streptococcus intermedius. The TLC method can also monitor the digestion of undecaprenyl (pyro)phosphate, whereas the HPLC method allows to separate the di-, mono- or unphosphorylated disaccharide pentapeptide products of lipid II. The peptidoglycan (PG) sacculus is an essential bacterial macromolecule that protects the cell from bursting due to its turgor and maintains the shape of the cell (Vollmer and Bertsche, 2008; Typas et al., 2012). PG is composed by glycan chains connected by short peptides. The PG from different species varies in the structure of the peptides and presence of secondary modifications (Vollmer et al., 2008). PG precursors are synthesized inside the cell and equipped with a carrier lipid for transport across the membrane prior to their polymerization at the outer leaflet of the cytoplasmic membrane (Barreteau et al., 2008). The universal bacterial carrier lipid is undecaprenyl phosphate (C55-P), which is synthesized in two steps. First, UppS uses farnesyl pyrophosphate (C15-PP) and eight isopentenyl pyrophosphate (C5-PP) molecules to produce the diphosphate form of the carrier lipid (C55-PP), which is then dephosphorylated to C55-P by membrane embedded phosphatases (UppP, or PAP2-type phosphatases) (Manat et al., 2014). The final precursor for PG synthesis is lipid II, the GlcNAc-MurNAc(pentapepide) building block linked to C55-PP. Lipid II is synthesized in two steps at the inner leaflet of the cytoplasmic membrane from UDP-MurNAc-pentapeptide, UDP-GlcNAc and C55-P by the enzymes MraY and MurG (Bouhss et al., 2008). PG glycosyltransferases (GTases) polymerize lipid II at the outer leaflet of the membrane to glycan chains. This reaction releases C55-PP which is dephosphorylated for new rounds of precursor synthesis and transport. Peptidoglycan synthesis is a prime target for antibacterial compounds and enzymes. Bacteria and higher organisms often produce antibacterial compounds to target competing bacteria and invading pathogens, respectively (Malanovic and Lohner, 2016). Bacterial competition is particularly fierce in dense populations such as biofilms and soil communities. Whilst the group of actinomycetes are known for their capability to secrete a repertoire of small metabolites that often show antibacterial activity, many Gram-negative bacteria utilize sophisticated type VI secretion systems to target adjacent bacterial cells by antimicrobial enzymes (Russell et al., 2011; 2012 and 2014). Another type of bacterial toxins are colicins, which are secreted by certain strains of Escherichia coli (Cascales et al., 2007). Colicins use energized nutrient uptake systems to enter the periplasm of susceptible strains of E. coli. Most colicins kill the target cell by inserting into the cytoplasmic membrane to form pores (Braun and Patzer, 2013). An exception is colicin M, which has a phosphatase activity against lipid II, cleaving the essential peptidoglycan precursor to disaccharide pyrophosphate and undecaprenol (El Ghachi et al., 2006). More recently, it was shown that some Gram-positive species use a type VII secretion system to target other bacteria (Cao et al., 2016). So far the best example is Streptococcus intermedius, which uses a type VII secretion system to deliver an antibacterial toxin, TelC, to target bacteria (Whitney et al., 2017). TelC was shown to degrade lipid II and C55-PP to release disaccharide pentapeptide and pyrophosphate, respectively, and undecaprenol. S. intermedius also produces the immunity protein TipC, which inactivates TelC by direct interaction to prevent the lysis of the toxin-producing cell (Whitney et al., 2017). In this methods paper, we provide a detailed description of the TLC and HPLC methods that established the degradation of lipid II and C55-PP by TelC (Whitney et al., 2017). These methods can be generally used to assess the activity and specificity of phosphatases against membrane-bound bacterial cell wall precursors. Note: Lipid II can be produced and purified by previously reported methods (Brötz et al., 1995; Qiao et al., 2017). Note: Used together with the radioactivity flow-through detector. Note: Alternatively, the muramidase mutanolysin (Sigma-Aldrich, catalog number: M9901 ) can be used. Note: All reactions are carried out in 1.5 ml microtubes and incubated using a microtube shaking incubator at 800 rpm. Reactions are carried out in a final volume of 50 μl and set up as described below for each substrate. All enzyme substrates are dried under vacuum and subsequently solubilized in the reaction mixture. Note: Take into account the constituents present in the storage buffer of the assayed proteins to calculate the buffer mixture. Prepare enzyme reactions with final concentrations of 30 mM HEPES/KOH pH 7.5, 150 mM KCl, 0.1% (w/v) Triton X-100, 40 µM lipid II (L-Lys). Add 2 µM phosphatase (e.g., TelCt), phosphatase-inhibitor complex (e.g., TelCt-TipC complex) or no enzyme (control) and incubate for 90 min at 37 °C. Prepare enzyme reactions with final concentrations of 20 mM HEPES/KOH pH 7.5, 150 mM KCl, 1 mM CaCl2, 0.1% (w/v) Triton X-100, 100 µM undecaprenyl monophosphate. Add 2 µM phosphatase (e.g., TelCt) or no enzyme (control) and incubate for 90 min at 37 °C. Prepare enzyme reactions with final concentrations of 20 mM HEPES/KOH pH 7.5, 50 mM KCl, 0.5 mM MgCl2, 1 mM CaCl2, 0.1% (w/v) Triton X-100, 40 µM farnesyl pyrophosphate, 400 µM isopentenyl pyrophosphate, 10 µM UppS. Add 2 µM phosphatase (e.g., TelCt), phosphatase-inhibitor complex (e.g., TelCt-TipC complex) or no enzyme (control) and incubate for 5 h at 25 °C, followed by an additional incubation for 90 min at 37 °C. Prepare enzyme reactions with final concentrations of 30 mM HEPES/KOH pH 7.5, 150 mM KCl, 0.1% (w/v) Triton X-100 and 100 µM undecaprenol. Incubate for 90 min at 37 °C. Terminate the reactions by adding 50 µl of n-butanol/pyridine acetate (2:1) pH 4.2. Vortex for 1 min and centrifuge for 3 min at 17,000 x g using a bench-top centrifuge to separate the organic phase (n-butanol) from the aqueous phase (pyridine-acetate, water). Note: This step is essential to extract hydrophobic (lipid II, C55-P, C55-OH) and amphiphilic (C55-PP and Triton X-100) substances from the mixture. These substances will be found in the upper, organic phase which will contribute to 1/3 of the total volume. Note: All steps are carried out in a chemical fume hood at room temperature if not indicated otherwise. The basic procedure for thin layer chromatography is shown in the published movie (Cockburn and Koropatkin, 2015). Pour the mobile phase into the developing chamber and adjust the solvent level to 1 cm. Close the chamber with the lid and allow for saturation of the gaseous phase with solvent (60 min). Incubate the TLC plate for at least 1 h at 60 °C to remove any humidity left from storage. Use a pencil to draw a line 1.5 cm from the bottom of the plate and mark sample spots. Sample spots are separated by 2 cm, and the distance from the outer spots to the edge of the plate should be at least 4 cm. Load the complete organic phase (upper phase, see Step A3) in 10 µl aliquots on the sample spots. After the addition of each aliquot, the spot is dried with a heat gun. Alternatively, the plate is left under a fume hood for each drying step. Note: It is important that the lower (aqueous) phase is not transferred on the plate, as this will result in smearing of the spots. When using a heat gun, it is important to not overheat the spots, as this can lead to degradation of compounds and additional bands. Place the TLC carefully in the developing chamber such that the solvent does not reach the spots. Optimally, there should be a distance of 0.5 cm between the solvent level and the pencil line. The TLC plate is incubated in the chamber with the lid on until the solvent front reaches 4/5 of the plate length, which takes 1.5-2 h.
Remove the plate from the chamber and dry it with a heat gun. The plate should be completely dried to avoid the appearance of solvent bands during staining. Place a small beaker with iodine in the chamber and put the lid on. Saturation will take 20-30 min at room temperature. Place the plate in the development chamber saturated with iodine vapor and incubate it until the spots are clearly visible (20 min-1 h). Representative examples of each reaction are shown in Figure 1. Figure 1. 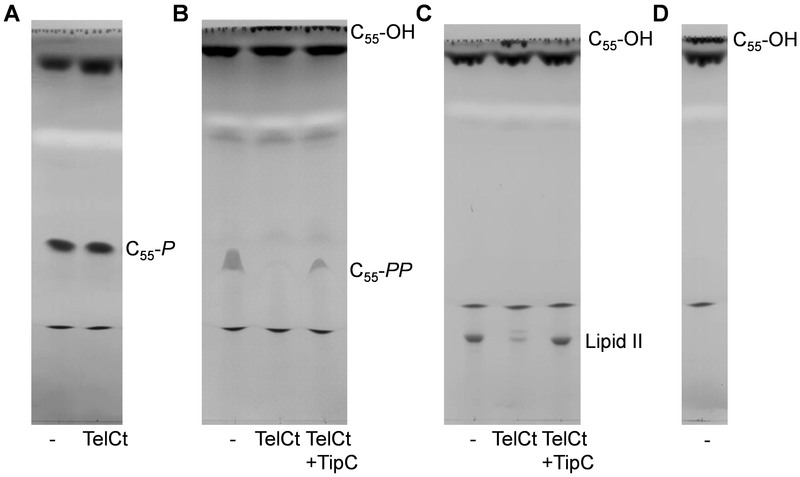 Lipid II and C55-PP, but not C55-P, are substrates of TelCt. Thin-layer chromatography analysis of the products obtained in reactions of TelCt (toxin domain of TelC) or TelCt-TipC with (A) C55-P, (B) C55-PP or (C) lipid II. D. C55-OH migrates at the solvent front. Control samples (-) contained no protein. TelCt was active against lipid II and C55-PP and was inhibited by its immunity protein TipC. The figure was adopted from Whitney et al. (2017). Note: Only lipid II and undecaprenyl monophosphate will appear as sharp bands. Due to its amphiphilic nature undecaprenyl pyrophosphate will appear as a crescent-shaped band between lipid II and undecaprenyl phosphate. The hydrophobic undecaprenol will always migrate at the solvent front, but will be visible after iodine staining. Take a high-resolution picture and determine the retention factor (Rf) using commercially available programs (e.g., ImageJ). Bands present in control reactions serve as a standard. Note: The distance is measured from the application line to the middle of the substance spots. For asymmetric spots (here: undecaprenyl pyrophosphate) measure the distance between the application line and lowest point of the spot. Spots in reaction mixtures should have similar Rf values, shape and color as spots derived from the standard compounds. Note: A control reaction, containing the peptidoglycan synthase PBP1B and its cognate activator LpoB, is assayed to polymerize lipid II into short glycan chains with C55-PP at the terminal MurNAc residue. Dry 10,000 dpm (~1 nmol) of [14C]GlcNAc-labeled lipid II-Lys, stored in chloroform/methanol (1:1), in a glass vial using a vacuum. Resuspend the lipid II in 5 μl of 0.2% (w/v) Triton X-100 and vortex for 10 sec at 1,800 rpm. Prepare in a 1.5 ml microtube a reaction buffer mixture with final concentrations of 15 mM HEPES/NaOH, pH 7.5, 10 mM MgCl2, 150 mM NaCl, 0.023% (w/v) Triton X-100 and 0.4 mM CaCl2 (the PBP1B-LpoB control reaction did not contain CaCl2) in a total reaction volume of 100 μl. Add 2 μM phosphatase (e.g., TelCt or Colicin M) or phosphatase-inhibitor complex (TelCt-TipC) to the reaction buffer. For a control sample add 0.75 μM PBP1B and 1.5 μM LpoB to the reaction buffer. Add the reaction mixture to the resuspended lipid II and incubate it for 60 min in a microtube shaking incubator at 37 °C with shaking (800 rpm). Spin down the condensation using a microcentrifuge. Adjust the pH of the sample to 3.5-4.0 using 20% phosphoric acid and pH indicator stripes. Note: Measure the pH by putting 0.3 μl sample onto the pH indicator stripe. Centrifuge the sample in a microcentrifuge for 15 min at maximum speed and room temperature. Transfer the supernatant into an HPLC vial containing a 400 µl vial insert. Incubate samples for 5 min at 100 °C using a dry bath, then spin down the condensation using a microcentrifuge. Let the samples cool down at room temperature for 2 min. Add 30 μl of cellosyl buffer (80 mM sodium phosphate, pH 4.8) and 10 µl of 0.5 µg µl-1 cellosyl (or mutanolysin) to the sample. Incubate the samples for 70 min in a microtube shaking incubator at 37 °C with shaking (800 rpm). Boil the reaction for 10 min at 100 °C on a dry bath and centrifuge the sample using a microcentrifuge for 15 min at maximum speed and room temperature. Punch a hole in the lid of a new 2 ml microcentrifuge tube using a needle. Note: The hole will allow releasing the H2 gas produced during the reduction step. Transfer the supernatant to the 2 ml microcentrifuge tube. Reduce the muropeptides by adding 100 μl of 0.5 M sodium borate, pH 9.0 and a tip of a spatula of solid sodium borohydride (ca. 1 mg). Incubate the sample for 30 min at room temperature in a microcentrifuge at 4,700 x g to prevent spillage due to gas bubbles. Note: Measure the pH by putting 0.3 μl of sample onto the pH indicator stripe. Wash with 100% methanol for 20 min at room temperature. Increase column temperature to 55 °C. Start a linear gradient for 30 min from 100% methanol to 100% Milli Q water, holding 100% Milli Q water for further 20 min. Wash with HPLC buffer B for 20 min and equilibrate the column with HPLC buffer A for 40 min. Do a buffer run following the same method used for the samples of interest (Steps B6-B9) but without injecting any sample. Inject the sample (leave 20 µl of the total reaction volume in the vial insert) and flush the injection loop with HPLC buffer A for 2 min. Start a linear elution gradient for 60 min from 100% HPLC buffer A to 50% HPLC buffer B, holding 50% HPLC buffer B for further 10 min. Re-equilibrate the column with 100% HPLC buffer A for 30 min. Representative HPLC chromatograms of each sample are shown in Figure 2. Figure 2. 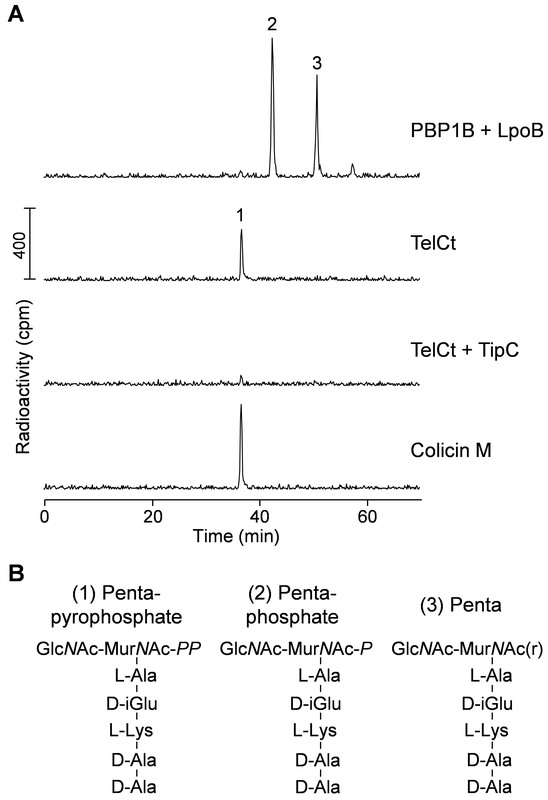 TelCt cleaves lipid II between undecaprenyl and pentapeptide-pyrophosphate. A. HPLC chromatograms of the radiolabeled products resultant from reactions containing Lys-Lipid II and the indicated proteins. PBP1B + LpoB reaction was further digested with cellosyl and reduced with sodium borohydride. B. Proposed structures of the main products (peaks 1-3 in panel A) of each reaction. GlcNAc, N-acetylglucosamine; MurNAc-PP, N-acetylmuramic acid pyrophosphate; MurNAc-P, N-acetylmuramic acid phosphate; MurNAc(r), N-acetylmuramitol; L-Ala, L-alanine; L-Lys, L-lysine; D-iGlu, D-isoglutamic acid; D-Ala, D-alanine. The figure was adopted from Whitney et al. (2017). Each reaction should be assayed in triplicate. The produced muropeptides are identified based on their retention time, using the software provided with the HPLC system (e.g., LauraTM, LabLogic Systems Ltd). If needed, the phosphatase product can be verified by mass spectrometry. For this, use 16 nmol of non-radioactive lipid II (Lys version) as substrate to perform the reaction as described above, using a UV detector set at 205 nm, and collect the product fraction. Dry the collected fraction in a SpeedVac and store it at -20 °C until mass spectrometry analysis as reported (Bui et al., 2009). Note: The products can be collected either manually or using the HPLC collector module. Note: Unless otherwise indicated, all stock solutions are prepared using Milli Q water. Note: Chloroform should be added step-wise and slowly to prevent phase separation. This work reports in detail the methods previously used to demonstrate the cleavage site of TelC in peptidoglycan precursors (Whitney et al., 2017). This work was funded by the UK Medical Research Council (MRC) within the Joint Programming Initiative on Antimicrobial Resistance ANR-14-JAMR-0003 (NAPCLI) and the AMR Cross-council initiative Collaborative Grant MR/N002679/1. The authors declare that they have no conflict of interest or competing interest. Barreteau, H., Kovac, A., Boniface, A., Sova, M., Gobec, S. and Blanot, D. (2008). Cytoplasmic steps of peptidoglycan biosynthesis. FEMS Microbiol Rev 32(2): 168-207. Bertsche, U., Kast, T., Wolf, B., Fraipont, C., Aarsman, M. E., Kannenberg, K., von Rechenberg, M., Nguyen-Disteche, M., den Blaauwen, T., Holtje, J. V. and Vollmer, W. (2006). Interaction between two murein (peptidoglycan) synthases, PBP3 and PBP1B, in Escherichia coli. Mol Microbiol 61(3): 675-690. Bouhss, A., Trunkfield, A. E., Bugg, T. D. and Mengin-Lecreulx, D. (2008). The biosynthesis of peptidoglycan lipid-linked intermediates. FEMS Microbiol Rev 32(2): 208-233. Braun, V. and Patzer, S. I. (2013). Intercellular communication by related bacterial protein toxins: colicins, contact-dependent inhibitors, and proteins exported by the type VI secretion system. FEMS Microbiol Lett 345(1): 13-21. Brötz, H., Bierbaum, G., Markus, A., Molitor, E. and Sahl, H. G. (1995). Mode of action of the lantibiotic mersacidin: inhibition of peptidoglycan biosynthesis via a novel mechanism? Antimicrob Agents Chemother 39(3): 714-719. Bui, N. K., Gray, J., Schwarz, H., Schumann, P., Blanot, D. and Vollmer, W. (2009). The peptidoglycan sacculus of Myxococcus xanthus has unusual structural features and is degraded during glycerol-induced myxospore development. J Bacteriol 191(2): 494-505. Cao, Z., Casabona, M. G., Kneuper, H., Chalmers, J. D. and Palmer, T. (2016). The type VII secretion system of Staphylococcus aureus secretes a nuclease toxin that targets competitor bacteria. Nat Microbiol 2: 16183. Cascales, E., Buchanan, S. K., Duche, D., Kleanthous, C., Lloubes, R., Postle, K., Riley, M., Slatin, S. and Cavard, D. (2007). Colicin biology. Microbiol Mol Biol Rev 71(1): 158-229. Cockburn, D. and Koropatkin, N. (2015). Product analysis of starch active enzymes by TLC. Bio-protocol 5(20): e1621. Egan, A. J. F., Biboy, J., van’t Veer, I., Breukink, E. and Vollmer, W. (2015). Activities and regulation of peptidoglycan synthases. Phil Trans R Soc B 370: 20150031. Egan, A. J., Jean, N. L., Koumoutsi, A., Bougault, C. M., Biboy, J., Sassine, J., Solovyova, A. S., Breukink, E., Typas, A., Vollmer, W. and Simorre, J. P. (2014). Outer-membrane lipoprotein LpoB spans the periplasm to stimulate the peptidoglycan synthase PBP1B. PNAS 111(22): 8197-8202. El Ghachi, M., Bouhss, A., Barreteau, H., Touze, T., Auger, G., Blanot, D. and Mengin-Lecreulx, D. (2006). Colicin M exerts its bacteriolytic effect via enzymatic degradation of undecaprenyl phosphate-linked peptidoglycan precursors. J Biol Chem 281(32): 22761-22772. Malanovic, N. and Lohner, K. (2016). Antimicrobial peptides targeting gram-positive bacteria. Pharmaceuticals (Basel) 9(3). Manat, G., Roure, S., Auger, R., Bouhss, A., Barreteau, H., Mengin-Lecreulx, D. and Touze, T. (2014). Deciphering the metabolism of undecaprenyl-phosphate: the bacterial cell-wall unit carrier at the membrane frontier. Microb Drug Resist 20(3): 199-214. Pan, J. J., Chiou, S. T. and Liang, P. H. (2000). Product distribution and pre-steady-state kinetic analysis of Escherichia coli undecaprenyl pyrophosphate synthase reaction. Biochemistry 39(35): 10936-10942. Qiao, Y., Srisuknimit, V., Rubino, F., Schaefer, K., Ruiz, N., Walker, S. and Kahne, D. (2017). Lipid II overproduction allows direct assay of transpeptidase inhibition by β-lactams. Nat Chem Biol 13(7): 793-798. Rick, P. D., Hubbard, G. L., Kitaoka, M., Nagaki, H., Kinoshita, T., Dowd, S., Simplaceanu, V. and Ho, C. (1998). Characterization of the lipid-carrier involved in the synthesis of enterobacterial common antigen (ECA) and identification of a novel phosphoglyceride in a mutant of Salmonella typhimurium defective in ECA synthesis. Glycobiology 8(6): 557-567. Russell, A. B., Hood, R. D., Bui, N. K., LeRoux, M., Vollmer, W. and Mougous, J. D. (2011). Type VI secretion delivers bacteriolytic effectors to target cells. Nature 475(7356): 343-347. Russell, A. B., Peterson, S. B. and Mougous, J. D. (2014). Type VI secretion system effectors: poisons with a purpose. Nat Rev Microbiol 12(2): 137-148. Russell, A. B., Singh, P., Brittnacher, M., Bui, N. K., Hood, R. D., Carl, M. A., Agnello, D. M., Schwarz, S., Goodlett, D. R., Vollmer, W. and Mougous, J. D. (2012). A widespread bacterial type VI secretion effector superfamily identified using a heuristic approach. Cell Host Microbe 11(5): 538-549. Typas, A., Banzhaf, M., Gross, C. A. and Vollmer, W. (2012). From the regulation of peptidoglycan synthesis to bacterial growth and morphology. Nat Rev Microbiol 10(2): 123-136.
van Heijenoort, Y., Gomez, M., Derrien, M., Ayala, J. and van Heijenoort, J. (1992). Membrane intermediates in the peptidoglycan metabolism of Escherichia coli: possible roles of PBP 1b and PBP 3. J Bacteriol 174(11): 3549-3557. Vollmer, W. and Bertsche, U. (2008). Murein (peptidoglycan) structure, architecture and biosynthesis in Escherichia coli. Biochim Biophys Acta 1778(9): 1714-1734. Vollmer, W., Blanot, D. and de Pedro, M. A. (2008). Peptidoglycan structure and architecture. FEMS Microbiol Rev 32(2): 149-167. Copyright Pazos et al. This article is distributed under the terms of the Creative Commons Attribution License (CC BY 4.0).